Farkel Dice high point scoring game has been entertaining and challenging players for years. 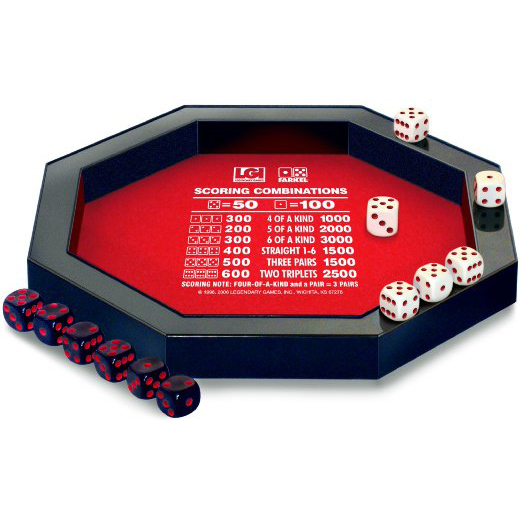 Along comes the Farkel Game Set which includes a deluxe dice tray with scoring combinations printed into the center felt cloth. Dice tray works wonders keeping those great rolls on the table and off the floor. In Farkel there are a variety of scoring combinations. A Player's turn continues as long as they are rolling scoring combinations. Keep accumulating points on your turn as long as you roll scoring points. At some point a player decides to keep accumulated points and end their turn. OR, maybe feeling lucky, you decide to roll one more time. Whoops! Should a player not roll scoring dice they lose all accumulated points. There is a great balance between prudence and avarice. Do you think you have the fastest hands in the west? Speed and keen eyes are the name of the game in Tenzi. Roll them quick and roll them fast! Not five, not seven, but TEN dice in your hand. Someone shouts Go! and the game is off with unprecedented speed. Rolling all of the same number is your aim, and you have as many chances as you need to do it.